Just west of Madrid, the Sierra de Gredos is Spain's secret heartland; a vibrantly contrasting montage of mountainous peaks, thundering waterfalls, verdant plains, fragrant fruit orchards and glacial lagoons. This region offers a wealth of varied walking routes from your base in the northern half of the Sierra in the tiny village of Hoyos del Espino, nestled on the edge of the Gredos Regional Park and against a breathtaking backdrop of jagged granite peaks. Choose from gentle meadow strolls through the flower-filled river valleys, or comfortable higher level hikes (the park is at 1800m), where you're likely to meet wild goats and spot huge griffon vultures soaring overhead. In order for you to really get to know the entire region, we have included complimentary car hire as well as detailed route notes for optional day walks in the southern half of the Sierra; a contrasting cluster of tiny Mediterranean-like villages tucked away among terraces of olives, figs and vines. The beautiful historic cities of Avila, Toledo and Salamanca are also easy day trips. You'll eat well on this holiday, our luxurious rural retreat, the stylish Hotel El Milano Real offers outstanding gastronomic menus and a la carte picnics on all walking days. In the evenings, expect mouth-watering temptations such as venison with wild berries or beef carpaccio with foie gras shavings and mustard vinaigrette. With an extensive bodega of more than 500 Spanish wines, we've included wine on the first evening to give you a taste of what's on offer! There are fabulous views from the hotel itself and the excellent Aguas de Gredos spa centre is just next door, great for aching muscles and offers a 15% discount to Headwater customers. Read more about this holiday in Stumpy's Blog. The walks are on varied terrain. Walking boots are essential, and walking poles recommended as there are several long descents. The itinerary page describes just a selection of the many excellent walks possible in this area. Some of the higher walks may not be possible in early season due to snow. Arrive at El Milano Real, your luxurious base for the next 7 nights, tucked away in the northern foothills of the Sierra de Gredos. Before dinner you will be welcomed with a glass of champagne and have the opportunity to discuss your week's walking options. A pine carpeted track takes you first to the peaceful River Tormes then, ascending gently past wild strawberries and pink crocus, you enjoy incredible 360Â°ree; views of the jagged Gredos mountains. Ibex cluster in the luscious pastures peppered with springs and fountains. Returning to the village, there's time for a drink in one of the friendly local bars before a gourmet dinner in the spectacular dining room. This magnificent walk takes you up to the impressive Laguna Grande set between the majestic Morezon and Almanzor peaks - the latter being the highest in the Gredos at 2,592m. The wild and dramatic glacial bowl is a fantastic picnic spot - look out for sure footed ibex silhouetted against the skyline. Above, red kites and huge griffon vultures soar on the thermals. A great day for enjoying the diverse landscapes of the Northern Gredos. Wend your way across the broom-covered hillsides with long distance views to tiny white villages nestled in the vines. There are shady pine woods, and flower-filled meadows where black Avila cattle graze as you pass to reach idyllic picnic spots by the river. We've left today free for independent exploring, however we strongly recommend the 50 minute drive to the historic Spanish city of Avila, a UNESCO World Heritage Site. Set against a backdrop of the Gredos Mountains, this walled city - many sections of the walls are still intact - dates back to C11, and its 87 towers and 9 gates are the most complete in Spain. Alternatively, Salamanca, is arguably the country's most graceful city with its dual Gothic and Romanesque cathedrals, and is just 90 minutes away. If the skies are clear today, you'll feel you can see forever! It's not unusual to have 70km views south all the way across the plain to the Toledo Mountains - especially if you climb to the top of the Morezon (2389m). A real 'on top of the world' experience shared only with wild goats! If you choose to stay close to home, today's relaxed walks explore the valley of the River Tormes. Look out for dippers as you amble past stunning waterfalls and through the shady forests and alpine meadows reminiscent of Switzerland. Alternatively we provide a selection of walks in the southern Gredos, just a 45-minute drive away. The Hotel El Milano Real is a beautiful 21-room hotel situated in the tiny village of Hoyos del Espino in the north of the Sierra de Gredos regional park. Each of the rooms at the hotel is individually styled, and all have en-suite facilities, satellite television, direct dial telephones, minibar and hairdryers. Headwater guests are allocated the standard rooms, which are beautifully decorated. It is possible to upgrade to a suite for a supplement. There is a wellness spa next door to the hotel and Headwater guests receive a 15% discount. Suite rooms have jacuzzi bath and more spacious. The Hotel Petit Palace Preciados enjoys an excellent position just off the bustling Puerta del Sol Square, which is considered one of the central spots in Old Madrid. The hotel itself lies just off the pedestrian area to the north where the famous Corte Ingles department store is located. You are ideally situated for exploring all of Madrid's famous sights. The hotel has a charming turn of century facade and many of the rooms have wrought iron balconies from which you can sit and watch the world go by. The 75 rooms are furnished in a modern style with laminate flooring and crisp white decor. All are double glazed and air-conditioned and are equipped with mini bar, satellite television and direct dial telephone. The bathrooms are well appointed and many have hydro massage showers. Room upgrades and extra nights: Contact us for details. Tour only prices exclude flights, but include Group B air-conditioned hire car which you collect from, and return to Madrid airport. Wonderful hotel, staff and food/wine! We had inclement weather including snow, so early April may not suit everyone. Driving was easy on good if winding roads. Our last night had clear skies, and we were lucky that the hotel could provide an English speaking guide to show us the stars etc via the observatory - not to be missed! Only real issue was the Europcar booking process which was confusing and over complicated. Petit Precios hotel in Madrid was fine, but rooms facing the street were a little noisy. A quiet, remote area of Spain yet full of interest. We visited three outstanding cities, all within driving distance - Avila, Sevogia and Salamanca. We interspersed these visits with walking days in the remote and beautiful countryside around the hotel. The hotel provided picnics which were delicious and the hotel food and local wine was outstanding. Impeccable organisation - everything arranged to perfection! On our arrival we were upgraded to a lovely room, (the Manhattan), it had great views, with a balcony overlooking the mountains. The room was very spacious and had a nice sitting area. The hotel was quite spacious with plenty of inside and outside sitting areas and a bar. The staff were always helpful and friendly and I felt they wanted to make our stay enjoyable. Daniel is particularly helpful with any problem. There was a good choice of food from the menu in the evening,both meat, fish and vegetarian options and many chocolate deserts. Our picnic lunches were exceptional, with fruit, nuts, salads and enormous baguettes of many varied fillings. I would highly recommend these if you are walking all day. The walks are very good. We wrote in their book where the instructions could be improved/updated. We enjoyed the whole experience. The weather in September is delightful and the hotel is clean and comfortable. The walking is lovely in the valleys and very rewarding with beautiful views from the tops of the mountains. The driving is very easy around Hoyos. A delight for birdwatchers and botanists in spring and early summer. Lots of opportunities for photography. Walks were flexible in length and difficulty. Car hire essential. It was one of the best walking holidays we have had. The hotel was superb with wonderful staff and food. The walking was excellent with varied terrain and scenery. I would highly recommend it to anyone. We had a wonderful holiday. The hotel was very comfortable (we did have a free upgrade as the hotel wasn't very busy). The staff could not have been more helpful. The walking was very varied and we were blessed with beautiful weather. Excellent holiday in little known area of Spain. A very comfortable stay in a lovely hotel with good walking on varied terrain in mountains close to Madrid yet unknown to us before we arrived. Very varied walking in a lovely area. The walks were of the right length with good descriptions. We had good advice from Teresa. This was not an area we would have gone to without you as we had never heard of it. In September it was quiet with very few other tourists Spanish or British. We had one cold day but otherwise it was good walking weather. I am really happy with Headwater in all aspects except, perhaps, the standard of accommodation (at times). Although, in this instance, you do advertise that the hotel's accommodation will be a standard room, there are no definitive descriptions of standard compared to other rooms/prices. The room we were offered would have 'sufficed', but when staying for a length of time I think it is evident that a more comfortable room with more amenities would make the holiday that much more of an enjoyable experience. That is difficult to deduce from your literature. (We upgraded at El Milano Real as soon as we arrived). When using your company in the past (on Inn-to-Inn walks) there have been other instances where we have felt a little let down by the quality of hotel. This was a hub Hotel walking holiday enabling us to select the walk to suit the daily weather with the expert and sound advice of the Rep Teresa (hotel owner). Having car hire we were able to spend the rainy day in Salamanca - where the sun shone! The first week in May found us trudging through snow on one walk and waltzing through spring flowers on another. All great fun. Ibex herds added to the entertainment on one of the walks. The Blue Book was up to date with additional helpful comments. Hotel staff were superb as was the cuisine and the views from the hotel. A very beautiful and undiscovered part of Spain. Well worth a visit. Great hotel locations, good food, very good service. We would love to visit this area again. Teresa was extremely helpful. The hotel was lovely and the food was plentiful and delicious. A fabulous quiet and beautiful area of Spain but within easy reach of some great cities. El Milano Real is a perfect base for the many and varied walks on offer through this unspoilt National Park with its great food and wine and accommodation. The highlight for us was a 'birding' walk with a local biologist who was just superb. The only down side was that we didn't get maximum benefit from Teresa (and Paco whom we didn't see at all) but on the other hand all their staff were excellent. 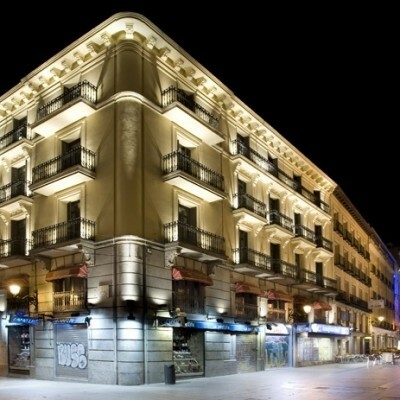 Had to book our own hotel in Madrid as Headwater's was strangely booked although available through booking.com! This holiday was superb. The scenery was unspoilt mountainous terrain and pastoral along the river valleys. Well away from tourist areas. A good variety of walks ranging from easy to quite challenging, with very accurate walking notes. We did Rio Tormes, Laguna Grande, Villages of the South to name a few. Saw 45+ species of birds. Weather in September was cool at night but got into low twenties in the afternoons. Typically 7 degrees warmer on the south side of the Sierras. We took the ferry from Portsmouth to Santander and drove down - very pleasant. The hotel was great and Teresa was a wonderful hostess. A fascinating area of Spain with varied landscapes from rugged mountains, to terraced hillsides with vineyards and fruit trees, gently flowing streams, Pine woods and open flat plains with Evergreen Oaks. Also abundant wildlife with dozens of bird species, wild mountain goats, Black cattle, and horses. Ancient walled cities and quaint villages. All within two hours of Madrid. The warmth of the welcome at El Milano Real was exceptional. Teresa was knowledgeable and enthusiastic about the area and the walks. She advised us about matching walks to the weather. The food was outstanding in quality and presentation. The route notes were exceptionally accurate. This was one of our best walking holidays ever. Very good holiday, we were made to feel very welcome at the hotel El Milano Real. Good mixture of walking options, some fairly challenging. Worth visiting the south side of the Sierra de Gredos for quite different climate and flora. A great week from start to finish. Excellent hotel. In particular Teresa the hotel owner, whose local knowledge, weather reports and enthusiasm were invaluable. A beautiful location to explore with varied and interesting walks. A holiday for not-too-serious walkers but definitely one for foodies. A really good holiday. Excellent Hotel and walking in a very quiet area. Will email some more detailed commets direct. A really excellent holiday in a relatively unknown but attractive location, with a superb hotel and a very helpful and knowledgeable hostess, and a good choice of walks. But for goodness sake improve the return directions to the airport - saying 'reverse the outward route' is hopelessly inadequate for negotiating the motorways of Madrid! This was our first walking holiday since we were teenagers and our first holiday without children. It was an excellent introduction. Good quality accommodation, a beautiful area and well guided walks. Sometimes the notes were a little unclear and we deliberately avoided a couple of walks that other travellers had said were difficult to follow but we only lost our way on one of the walks and think this was because there had been substantial recent tree felling and logging that obliterated the tracks. Our host Theresa was excellent and took her responsibilities very seriously in ensuring we were safe and happy. We also had the pleasure of meeting other headwater guests and spent some meals and walks together which was an added bonus. In summary, a well organised and enjoyable holiday. I did find the notes back to the airport from the Gredos mountains very difficult, as it said 'reverse your original notes from Madrid Airport'. I thought this very lazy as we were taking many motorways and A roads and they were not clear to start with. There was plenty of space on the page and it felt as though we were being ignored at this stage. The Gredos is a wonderful location for walking holidays and Milano Real provides and excellent base. This holiday offers lots of walking options from dramatic high level mountain views to idyllic river valleys resounding with tinkling cow bells and trickling streams. We had a fascinating day in Salamanca when we fancied a change from walking and the journey through the mountains added to our enjoyment of the day. Last but by no means least, Teresa and Paco were superb hosts and nothing seemed to be too much trouble to make sure we enjoyed our stay. We will definitely be back. The combination of a fine hotel location, dramatic countryside and superb food made this a unique holiday which brought us new and welcome experiences. We chose walks that ranged from beautiful countryside rambles to testing mountain ascents. In view of the excellent local advice, it is easy to tailor the nature and difficulty of the walks to your own abilities and inclinations. In addition, the gastronomy was first class. Lovely location, great hotel, wonderful support from hotel staff in our 'hour-of-need, varied walks and opportunity to visit an historical Spanish city. El Milano Real walking holiday was the perfect combination of fantastic walks, outstandingly delicious food and a warm welcome. The service and level of advice was great. A beautiful place with some stunning walking in the mountains. A great holiday in an off the beaten track location. The Hotel El Milano Real was an excellent base for a walking holiday as several walks could be done directly from the hotel. The food was usually good, sometimes excellent but occasionally disappointing: the wines were generally very good and also very reasonably priced. The weather during the week was unseasonably cold, which spoiled our enjoyment of the highest climbing - we were unable even to attempt Morezon - but the superb walk to the Mirador was completed in very pleasant conditions and we were glad it wasn't too hot. The area is rich in flora and fauna, and May is a good time of year for observing it. 1 The map situation was dire.You say in the walking notes that the map you provide is the 'Sierra de Gredos 1:25000. You gave us a map which was an area to the South West of where we were in Hoyos de Espina. We should have been given the correct map and it is 1: 50000 not the above. As you point out the other map (Parque Regional de La Sierra de Gredos) which is 1:25000 only covers the Plataforma area. 2 The spa was not open until the Friday of our stay and that should have been made clear in the notes/brochure. Only the weather let us down.... The hotel was delightful and the staff really helpful; the food was execllent and certainly pleantiful with the breakfasts well deserving of the description 'amazing'. Snow and rain prevented our walking as we had hoped and there is little else to do in the immediate vicinity but lots of beautiful places to see if you are prepared to drive (and the roads are surprisingly good). We thoroughly enjoyed our week in the Sierra de Gredos, which is a beautiful, uncommercialised region that is excellent for walking. Teresa was a mine of information, not just on the walks but also on the weather in different parts of the region and even on what wine to have with dinner! The hotel staff were friendly and attentive. The food was wonderful and there was plenty of it! Overall, a great holiday. Great friendly hotel with excellent food - Theresa was full of local knowledge particularly on the weather (which wasn't brilliant when we were there in early October) where she was spot on. Good walking (particularly the higher walks) and the instructions for the walks excellent. We would recommend this holiday. One small criticism a map from the airport to the hotel would have been useful as the instructions were not very clear or take your own sat nav. Excellent for walking with a good variety of walks at various lengths and levels of challenge. Hotel location and village very good. Food excellent and a vegetarian well catered for. This was a fabulous holiday in an area that was totally unknown to us. The landscape was stunning, the walks varied and the location ideal for visits to the cities of Avila, Salamanca, Segovia , Madrid and Toledo - all on empty, excellently- maintained roads. The hotel was exceptional with amazing food and service. We would thoroughly recommend this holiday for all the experiences it offers but would suggest booking a minimum of 10 days to ensure you able to fit everything in!! An excellent holiday. All the travel arrangements involving air travel and car hire were excellent. The Hotel El Milano Real was excellent and the food superb. Teresa was an excellent host. Scenery excellent. The waymarks on some of the walks need updating and an indication of the distances between waymarks would be helpful. Also distances on the route from Madrid to Hoyos del Espino would be helpful. We have just enjoyed our second wonderful holiday at the Milano Real. The walks here are very varied, with scenery that ranges from green and leafy woods and meadows to impressive wild and barren terrain. The hotel is very friendly and welcoming and the food is superb, from the imaginative and unusual breakfasts, to the a la carte 3-course picnics to the tempting and varied evening menu, eaten while watching amazing sunsets. We strongly recommend this holiday! The owners of the hotel really went the extra mile to makes us welcome. Their service was excellent and the quality of the food was superb, dealing with one of our party with a wheat intolerance with ease. The Sierra de Gredos region of Spain is an outstandingly beautiful area of mountains, valleys and rural villages. It's an easy 2-hour drive from Madrid and the hotel El Milano Real in the village of Hoya del Espino can barely be faulted. In particular, the range and quality of the food on offer is of the highest order. Also, the views from the hotel of the Gredos range are breathtaking. The walking is varied from fairly demanding, to reach the higher areas with magnificent views, to idyllically rural along lovely river valleys. 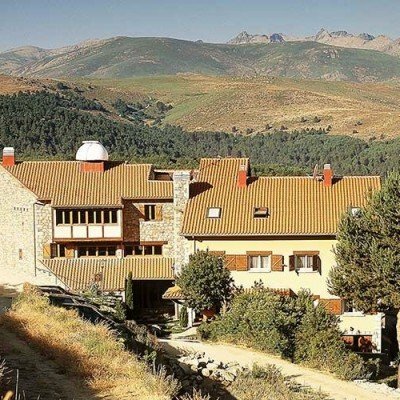 The Sierra De Gredos is a fantastic destination in July/August and the Hotel El Milano Real in Hoyos Del Espino is a perfect place to base the holiday. The weather on the north side was perfect for walking, blue skies all week - high 20's near the hotel and low 20's in the mountains. The food and service in the hotel was excellent and everyone was very friendly. This was our first Headwater holiday and I hope that the other destinations can live up to this one. We particularly like Headwater holidays as they take you to unexplored regions of countries which are unspoilt by tourism and overcrowding. We extended our holiday and stayed in Segovia for a few days which we loved and we had the opportunity to go to Salamanca for a day. The Sierra de Gredos holiday was very enjoyable. The hotel's normal clientele are weekend visitors from Madrid; a bit like the Lake District for the Midlands. The food (breakfast, packed lunches and dinner) was excellent, though quite different from British food. The walking was very good, but we were glad we had come in April as there is very little shade. The Sierra de Gredos has something for everyone who enjoys exploring the outdoors - from river banks to pine forests; from open heaths and alpine terrain. To have these in such a small area makes for a wonderfully varied break. Combined with a comfortable and relaxing stay in the Hotel El Milano Real, we wondered why it took us so long to try this Headwater break! Selected Sundays from 28th Apr 2019 to 16th Aug 2020, for 7 nights. All dates are subject to availability, please contact us to check. Due to the tailor-made nature of our holidays, we need a little more information in order for us to check availability for Walking in the Sierra de Gredos. Simply complete the form below and a member of our sales team will contact you (when it's most convenient for you) to provide availability information, travel options and an accurate price. Of course there's no obligation, but if you do wish to proceed with a booking they will be on-hand to assist you throughout the process.